The Walbeck Elite played the Hardtke Braves at Delta College in Stockton in the fourth day of the NorCal NIT Tournament. 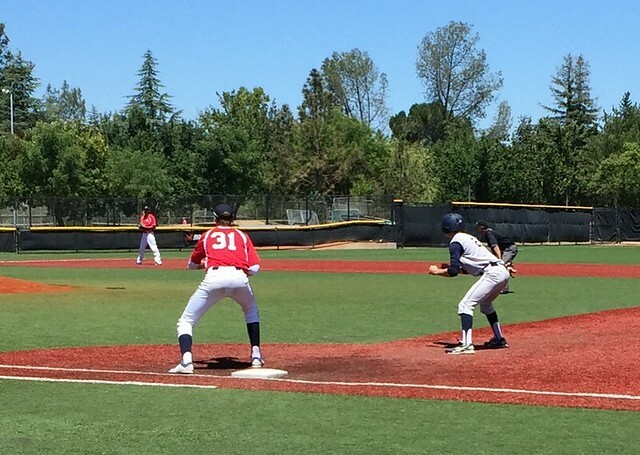 The Elite played against the Hardtke Braves in a tournament in San Jose last summer. Jack did not bat. He entered the game in the top of the second as a courtesy runner for Jury (Catcher). He went to second on a wild pitch and then scored on Gregory's double. Immediately after scoring, he replaced Cregory (Pitcher) as a courtesy runner. He went to third on Starosciak's ground out and scored on Richardson's single. In the field, Jack played three innings in right field. He had one put-out. Behind a strong pitching performance by Gregory, the Elite won the game by the score of 3 to 2. It got interesting in the bottom of the seventh. After striking out the first batter, Kane walked and then hit a batter. With runners on first and second and one out, Rossitto came in and got the last two outs. The scorecard is here. For the summer season, the Elite have a record of 2 win and 4 losses. The game log is here. The Elite are scheduled to play in the Zoots tournament in the bay area next weekend. Sharon, Jack and I finished Father's day with an early dinner at Rey Azteca, a long walk with Tiber to the river and presents (a tie and cologne) at home.